Looking for a change in role? Consider Environmental Health and Safety (EH&S). Our research shows some promising opportunities for environmental professionals interested in this area, due in part to a lack of qualified applicants and industry trends that point to employers hiring more EH&S workers in the future. Why are they hiring more? Our study points to compliance as a major factor, as organizations work to meet increased environmental regulations. New programs, initiatives and legislation aimed at improving the environment and health and safety of the community have given rise to demands for a larger workforce. EH&S workers are a group with diverse skills. The report notes that the workforce of 79,000+ includes occupational health and safety specialists, nurses, attorneys, engineers and technicians. For professionals considering a move to the environmental industry, this diversity spells one thing: opportunity. EH&S professionals have technical competencies and specialized environmental, health and safety knowledge — but as with other environmental careers, the mix of skills required for any role can vary, and that variation may mean those new to the industry can fill a role with existing expertise while acquiring more specialized knowledge and skills. Want to learn more? 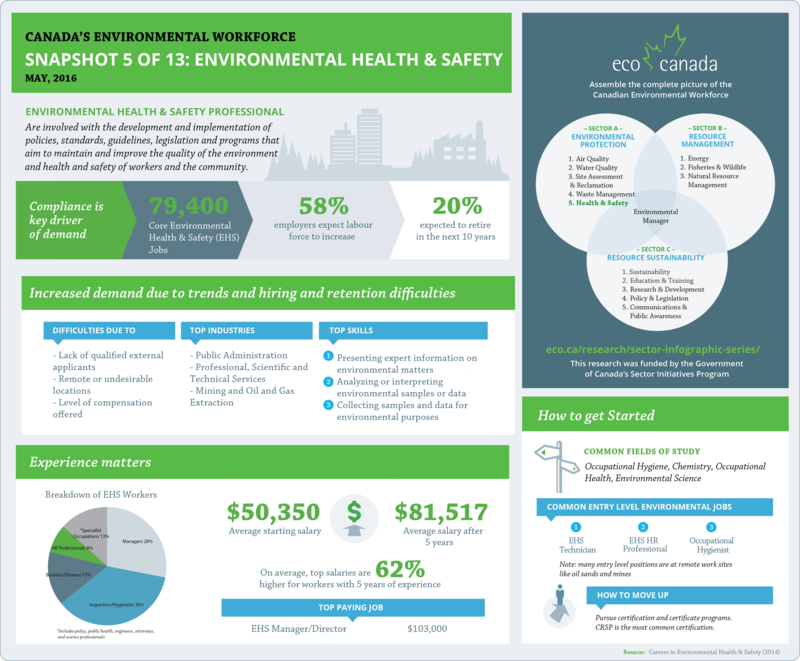 Take a look at the monthly snapshot below for an overview of the challenges and opportunities in the Environmental Health and Safety sub-sector. Make sure to check back as we look at other areas of the sector!